It’s been 20 years since the first Donkey Kong Country game. Twenty years. 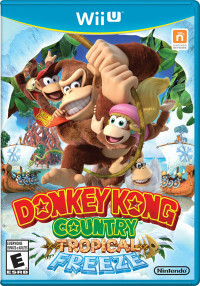 The series has consistently delivered a brand of challenge unique to 2D platformers, and Retro Studios successfully took up the torch with Donkey Kong Country Returns on the Wii. For their second attempt, Retro Studios has abandoned the villains of Returns, the Tiki Tak Tribe, and replaced them with the Snowmads, a band of Nordic walruses, penguins, rabbits and owls, who crash Donkey Kong’s birthday party and blanket his island in snow for no apparent reason. The Snowmads are slightly goofier and more animated than the Tikis, and they set the stage for a game that is also slightly better than its predecessor. It’s another Donkey Kong Country game. I don’t want to seem too dismissive, because it’s a really good Donkey Kong Country game, but it doesn’t do anything to drastically change up that formula. 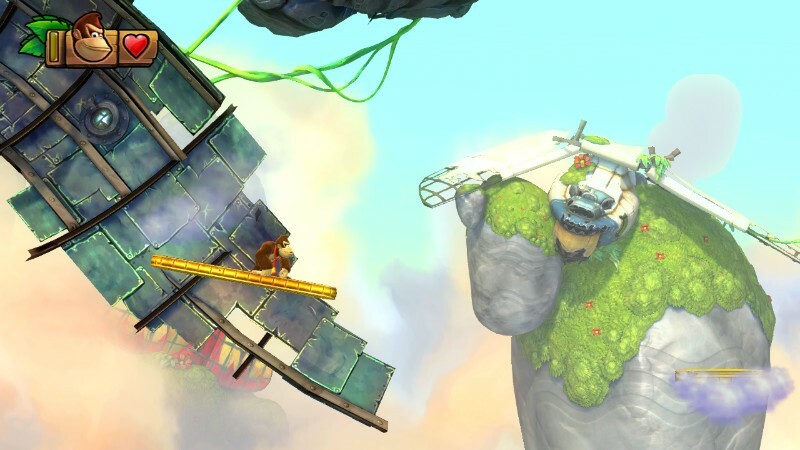 New additions include Kong buddies to enhance your platforming skills — Dixie helicopters to greater heights, Diddy jetpacks horizontally, and Cranky pogo-sticks on spikes — and two-player co-op with those characters. You’ll still be rolling through enemies, blasting between barrels, swinging from vines, hunting for secrets, and dying a lot. That’s not necessarily a bad thing. It’s all very familiar, but it’s all still so fun. The levels are designed around this sense of momentum… most of the time. Honestly, it’s difficult to assess this aspect of the game. Almost every time I was caught off guard by the forward progression of a level and didn’t feel like I had enough time to properly react, I would replay the section and realize that I had missed some environmental clue. For example, in one of the later levels, floating platforms fly across the screen then quickly drop off as another platform flies onto the screen just as quickly. Timing these jumps is nearly impossible unless you’ve noticed that each floating platform has a wisp of cloud at its base that dissipates from right to left as the platform moves. The cloud acts as a timer, so that when the cloud has completely blown away, the platform will drop. Features like this are ingenious, but they’re not always immediately apparent. I’m not sure if this is a flaw or an attribute of the game that requires intense focus to play properly. Some of the new mechanics are gently introduced at the start of a level, giving you a simple example of how to read the environment in that particular level. Other mechanics seem to be sprung on you in the heat of the moment, often leading to instant death. Again, intense focus and attention to detail can help avoid this, but that fact doesn’t reduce the frustration when something surprises you. That can be part of the fun, though, and the sheer variety of environmental hazards keeps the platforming interesting. These environmental clues set Tropical Freeze apart from games like Super Mario 3D World, which thrives on the freedom of abstract level design, throwing floating blocks and spinning cylinders every which way, with the only logic being the integrity of the platforming. Tropical Freeze does the same thing, but it assigns environmental logic to literally everything. This is the game’s greatest strength. Each level establishes a specific theme and forms platforming challenges based on it. Poles to jump between are actually the necks of papier-mache giraffes, rotating platforms are actually skewers that pop up to impale flying fruit, underwater scythes are actually food processor blades to chop incoming fruit, etc. The amount of care put into these details is impressive, and it adds a sense of style and personality to the game beyond most platformers. The music helps drive that sense of personality as well. David Wise, the original composer for the SNES Donkey Kong Country games, has returned to the series in Tropical Freeze. All of the music is great, but some themes stick out as being exceptional. The aforementioned level with the papier-mache giraffes, for example, begins with an upbeat, African-sounding vocal theme as you traverse a dancing savannah, then it changes to a low chant as individual animals show up and bob to the music. Tropical Freeze follows the same basic structure as Donkey Kong Country Returns, which means there’s a ton of stuff to focus on in each level besides simply getting to the end. First, each level has a handful of puzzle pieces to find. Most of these are hidden (behind secret walls, in secret barrels, etc. ), some appear after collecting a string of bananas, and some require a difficult platforming feat to obtain. Many of them are very difficult to find, but the lack of a level timer allows for the freedom to explore as much as you want, which can be really fun. Collecting all of them in a level simply unlocks a piece of concept art, though, so it isn’t necessary to get them all to see all of the game’s content. Second, each of the six worlds has at least one level with a secret exit. The secret levels show up on the overworld map, and there’s usually a clue on the map as to which regular level has the secret exit. Some of the exits are extraordinarily well hidden, and scouring a level to find the secret exit is always fun. 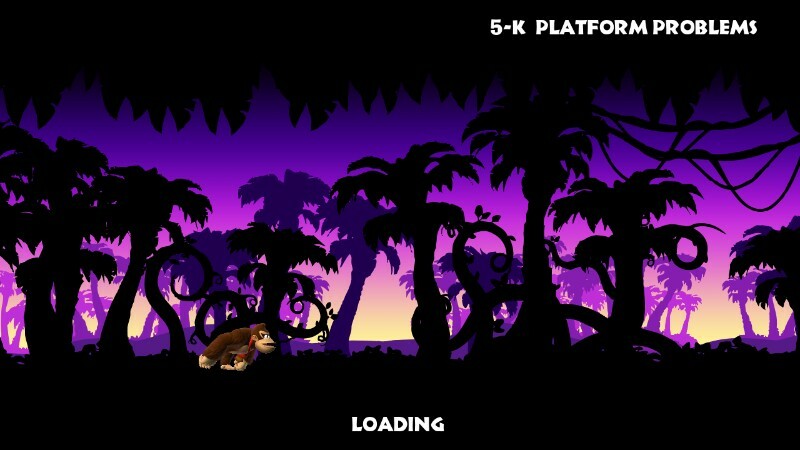 Finally, every level contains four letters to collect to spell KONG. They’re not usually hidden, but they often require a bit of tricky platforming to obtain. Grab them all in each level in a world, and another level will be unlocked. These K Temple levels have no checkpoints, no environmental theme, no frills. They’re abstract platforming challenges designed around a specific mechanic. For example, one of the levels focuses on your ability to jump on long strings of floating enemies through most of the level. These levels are fun to play and extremely rewarding to complete, and finishing all of them unlocks a secret world that tests all of your platforming skills. This structure encourages you to replay levels, and the fantastic environmental design makes it even more fun to go back in. If you still want more, Time Attack mode requires you to make a nearly perfect run, almost without stopping, in order to earn a medal. You basically need to memorize the layout of the level and try different things to cut some time off. This mode isn’t for everyone, but it helps to demonstrate the intelligence of the level design. Even if you have no interest in this mode yourself, it’s fascinating to watch the replays of the top players on the worldwide leaderboards to see what kind of craziness they pull off to record their fastest times. All in all, I spent about 20 hours in Tropical Freeze simply playing through the game and unlocking all of the levels. Collecting the puzzle pieces and playing through again on Hard mode could easily double that time, and I didn’t feel burned out on the game even after 20 hours. This is an actual screenshot of the gamepad screen during play. One last thing… I haven’t mentioned the Wii U’s gamepad screen because it isn’t used for anything other than off-TV play. The game asks you to choose your display each time you boot up the game, and if you choose Television, the gamepad screen goes black. This is fine with me; even though it would’ve been nice for Retro to try something creative with the touch screen, I’m fine with them not shoe-horning awkward functionality into a game that is great without it. 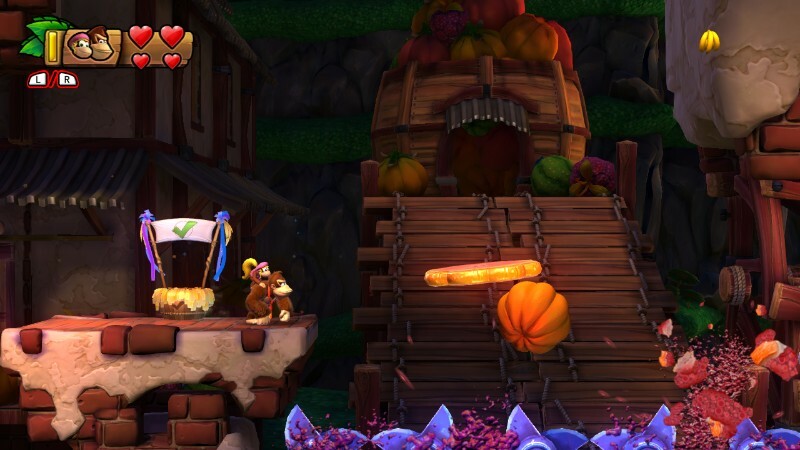 Donkey Kong Country: Tropical Freeze is more Donkey Kong Country. Either you want more or you don’t. Luckily for the people who do, it’s an excellent entry in the series, iterating just enough on the established formula to keep it from feeling like nothing more than a big level pack.